We have learned from a variety of corroborating local sources that, on 8 May 2012, Nepalese authorities and a contingent of some 2,000 armed police carried out a large-scale forced eviction in Kathmandu, using excessive force and neglecting due process or alternative housing rights. The affected community is a cluster of informal settlements at Thapathali, on the banks of the Bagmati River. In this act of state violence, authorities destroyed over 248 houses and a school, rendering 994 persons homeless, including 401 children below the age of 15. Most had been living there for the past six years, but 11 houses at Kuriya Gaon have been there for 20 years. Thousands of families living in the banks of the Bagmati River reportedly are presently facing similar eviction without having been provided any alternative housing. Residents report that as many as 23,000 may be affected. Police reportedly used rubber bullets and tear as to subdue their victims at Thpathali. They assaulted several civilians, including by beating elderly persons, pregnant women and children. Reportedly, some 25–30 people were injured by the beatings, including four who suffered serious head injuries. Among them was Nima Sherpa, against whom police fired a teargas canister, wounding him in the head. Local sources report also that police had beaten women who attempted to return to their houses to rescue some of their belongings. The police prevented those injured from accessing medical treatment until 16:00, when they finally allowed them to seek treatment at the Bir Hospital. According to the police, 31 people were taken into custody. Local NGOs reported that this number included several children. Women and children were released in the evening, and the others arrested were released the following day. Despite numerous efforts by civil society, including the United National Landless Squatters Front, to negotiation a solution consistent with Nepal’s State obligations to provide proper conditions and alternative housing in the case of an eviction, you oversaw the Thapathali eviction by force, resulting in numerous violations of the residents’ human rights and norms binding on Nepal. This forced eviction action also contravened judicial orders, affirmed by the Supreme Court, to develop and implement an alternative housing plan for the landless squatters prior to any displacement. While no domestic legal framework yet regulates evictions in Nepal, the Interim Constitution of Nepal guarantees human rights, including all economic, social and cultural rights, and international minimum norms also apply. However, the Thapathali forced eviction and demolition violate international law and Nepal’s international and national human rights obligations. These include the International Covenant on Economic, Social and Cultural Rights (ICESCR), which Nepal ratified in in 1991. States party to ICESCR, under Article 11, recognize the human right of everyone to “an adequate standard of living, including…adequate housing, and to the continuous improvement of living conditions.” These evictions also have violated the congruent rights of the inhabitants related to adequate housing, including the right to food, the right to water, the right to health, the right to education and the right to work and means of subsistence, participation and access to justice. These rights, as integral to the right to housing, are also supported in General Comments No. 4 (1991) and No. 7 (1997) of the United Nations Committee on Economic, Social and Cultural Rights (CESCR), which oversees compliance with ICESCR. These international instruments recognize that "forced eviction are prima facie incompatible with the requirements of the Covenant and can only be justified in the most exceptional circumstances." Thus, international law imposes certain minimum norms and obligations that State parties to the Covenant must respect, including the need to inform affected people well in advance, to agree with them on a plan for rehousing with secure tenure, and to provide adequate compensation, as well as reparations in the case of forced eviction. To ensure these rights consistent with CESCR General Comment No. 7, it is understood that no one may be forcefully evicted without (1) effective and sufficient consultations with the affected parties, and (2) provision of appropriate and sufficient alternative measures. In other words, these minimum international norms guarantee for those who suffer eviction access to appropriate measures, particularly the rights to alternative shelter in order to secure an adequate living, and to assure sustaining economic activities where they newly reside. Grounded in Nepal’s existing treaty obligations, the UN Basic Principles and Guidelines on Development-based Evictions and Displacement further stress that States should adopt, to the maximum of their available resources, appropriate strategies, policies and programs to ensure effective protection of individuals, groups and communities against forced eviction and its consequences. According to the UN Basic Principles and Guidelines, States and governments at all levels also should take specific preventive measures to avoid and/or eliminate underlying causes of forced evictions, and prosecute those who commit forced eviction as a gross violation of human rights. In its plan to relocate the community to Ichangu Narayan area, the government bears the further responsibility to ensure that the relocation site fulfill the criteria for adequate housing according to international human rights law, including services for accessing adequate food, water, employment options, schools, and health-care facilities. The UN Basic Principles and Guidelines on Development-based Evictions and Displacement further specify that “Evictions shall not be carried out in a manner that violates the dignity and human rights to life and security of those affected. Any legal use of force must respect the principles of necessity and proportionality.” This apparently has not been upheld in Thapathali. In the case of these already-committed and threatened evictions, HPCIDBC and local authorities not only are violating State obligations of Nepal under ICESCR and other human rights instruments. They also have failed to inform the affected Thapathali population of their fate, as planned by HPCIDBC and the local authorities, or to allow recourse in pursuit of other options, either in monetary compensation, alternative housing, or any form of reparation. HPCIDBC`s planning and execution of public works projects in this way reveal a deep prejudice and material discrimination against impoverished citizens and the homeless. In this case, local authorities have become perpetrators of gross violations, and have made their victims the subject of reparations for which the State now bears ultimate liability. Necessary measures toward development of domestic legislation regulating housing and eviction policies and practices in Nepal consistent with its international treaty obligations and other relevant human rights norms. 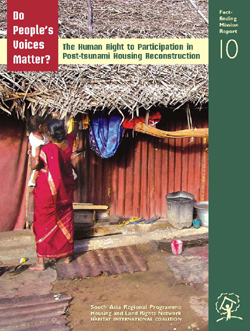 The over-400 Member organizations of Habitat International Coalition and its Housing and Land Rights Network, in over 120 countries, oppose the exclusion of the poor and the creation of needless deprivation and deepening poverty through forced evictions. Instead, we promote the many civil alternatives to such conduct, as developed in the norms of international law upholding human rights, in particular the human right to adequate housing and the corresponding obligations of the State. We urge you and your offices to apply the same minimum norms of conduct in the public service, and we look forward to hearing of your efforts to apply them to the reparation of harm done to the persons rendered homeless by the Thapathali evictions.